I turned, and set aside, this bowl months ago. Not because it was wet, and that’s the thing, evidently, to do. I set it aside because I could not, at the time, make the inside smooth to save my life. 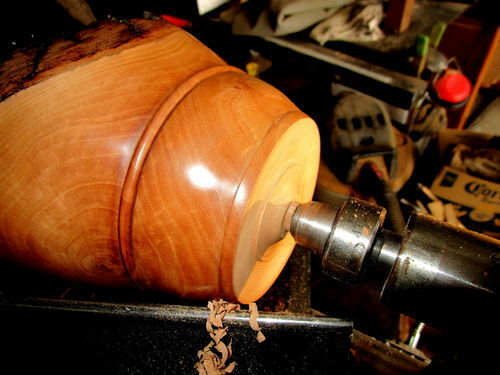 I started this bowl on the Shopsmith. I had, apparently, filled the cracks from the outside with CA or Epoxy. I don’t recall. 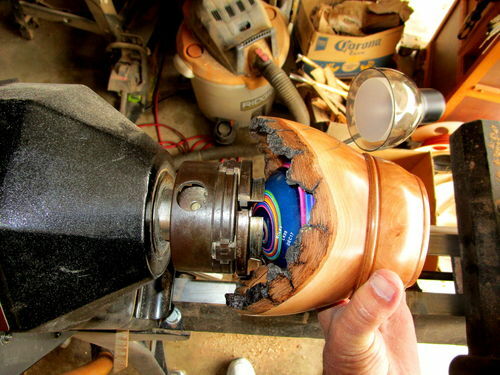 Now, my tools are sharper, better, newer, and, best of all, my lathe is much better. It’s Peach, this bowl. 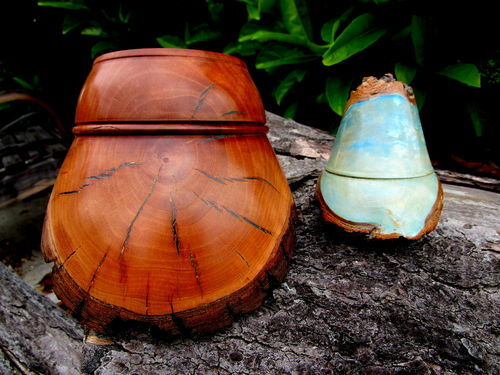 It has a live edge, this bowl. Almost all the bark stayed on this bowl. I like it a lot. It’s finished in YG and HS. It’s 6” diameter and 5” tall. And, since you asked how I did such a swell job on the bottom. 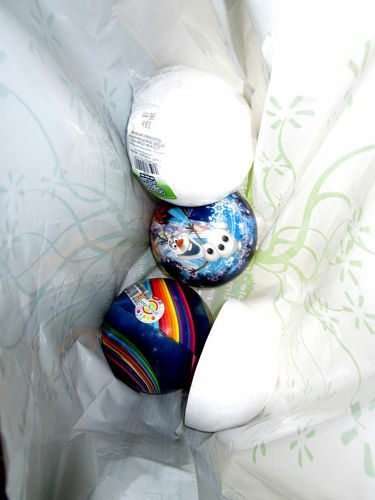 I went ball shopping this morning. That’s right. Wilson got balls. I tried one of the rubber ones. 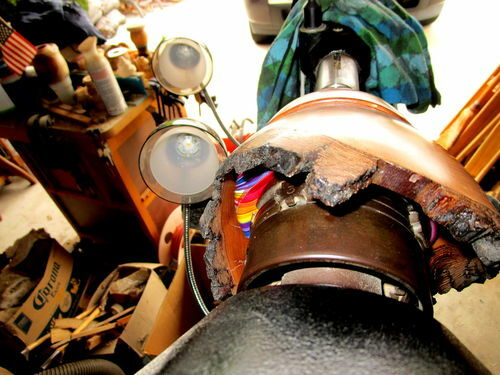 Squashed it on with the tailstock. It wasn’t holding firmly enough. So I tried the Styrofoam half-ball. 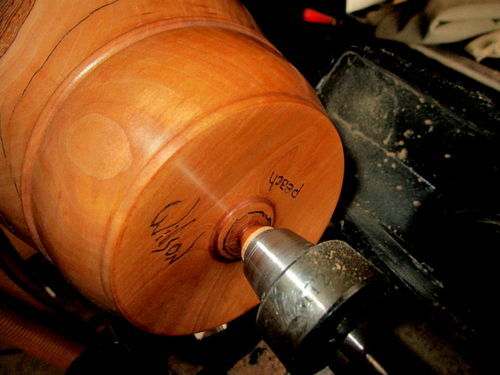 I even signed it on the lathe. He turned it upside-down, and I saw something familiar. I knew, immediately, what it was. I walked across the room, picked this, and showed him. Apparently, I have a thing for that shape. im glad you got back to it,that came out beautifully,i love the live edge also.very nice work buddy,but i expect no less. Great job, beautiful finish, and absolutely nothing wrong with revisiting a familiar shape – all the best artists did it. Look at how many times Monet painted water lilies, or all of the times Remington sculpted a horse, or all of the times that I. M. Pei built a steel and glass tower. hey i wanted too say it but i didn’t have the balls either-lol. I really like this one allot Mark! That live edge looks fantastic! Great work! 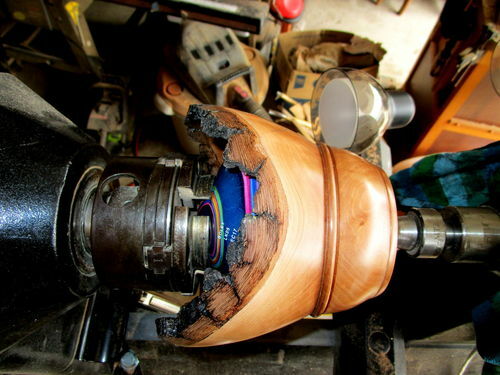 Hey Mark, That is really beautiful, love the shape and the Peach wood. Honorable Bob: That’s what I’ve been doing, mostly. But, on this piece, the bottom is very concave. I’m pretty sure I’d have messed up the bottom edge. Great work Mark. I like the peach blanks too. The bark does seem to hold on to them well. I like your idea of the rubber ball, I’ll have to try it. No No, Dave. The rubber one didn’t work. 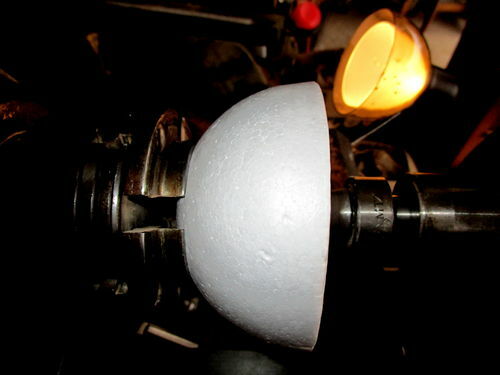 The Styrofoam half-sphere is what I used. Mark, still learning how to read. LOL. 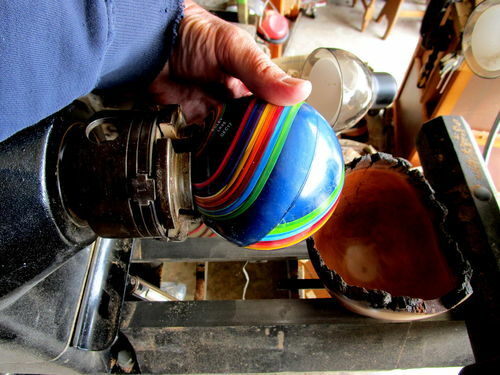 I wonder if the rubber ball would work better if it didn’t have a finish on it. I’ll have to try both. Thanks for getting me in the right direction. Love the live edge Mark. Nicely done! !